I’ve been on a reading binge lately, both print and on my Kindle. The latest book I read was called Sisterhood Everlasting. It is the fifth installment of the bestselling Sisterhood of the Traveling Pants series. 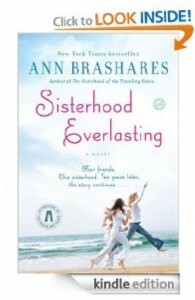 Sisterhood Everlasting will appeal to those who grew up along with the previous books. The first four are more for the young adult audience, and the series finishes when the friends are still in college. I actually didn’t discover them until I was already in college myself. That was when the original movie first came out. The Sisterhood of the Traveling Pants series consists of four friends, Carmen, Tibby, Bridget, and Lena, who all grew up in the same town. They all have very different personalities. They find a pair of pants that carry special meaning. It goes wherever they go, kind of like a Flat Stanley type of thing. Sisterhood Everlasting is set ten years later. The author took a break to write other books and explore other things, then came back to revisit her characters in this series. The four teenagers are now almost 30, and are each finding their way in the life of being an adult. Work, marriage, children, etc. I could really relate to the post college craziness of trying to find my way in the “real world.” This book is emotional to say the least, and the author does a good job of getting into the heads of her characters to capture what they were thinking. Especially how they each handled grief in their own way. This book has goes a lot deeper than your typical beach read. I highly recommend it. After shopping around, the Kindle and paperbacks are about comparable in price. The handy part about the Kindle edition was that I could sneak a few pages during breaks at work on my phone’s Kindle app. The following reviewer sums up Sisterhood Everlasting quite well. This entry was posted in Uncategorized and tagged ann brashares, sisterhood everlasting, sisterhood of the traveling pants, young adult fiction by holly. Bookmark the permalink.